Mansion Lavanda promises its customers that by booking directly, you are getting the best deal online. If you have a confirmed direct online booking with Mansion Lavanda and find a cheaper price for the same offer within 24 hours on another website, we will match that price. Mansion Lavanda will make available the best guest room \ price for the hotel (the "Best Price Guarantee"). " Mansion Lavanda Website" are the websites owned or operated by or on behalf of Mansion Lavanda bearing the logo and branding of Mansion Lavanda. In the unlikely event that a lower price at Mansion Lavanda is made available on a non-Mansion Lavanda website (the "Competing Price"), upon its receipt of a claim that satisfies these Best Price Guarantee terms and conditions (the "BPG Terms"), Mansion Lavanda will honor that Competing Price and provide the individual that submitted the valid claim one of the following: (1) an additional 10% discount off the Competing Price per room per night; or (2) a voucher that the guest can use during their stay, the amount of the voucher will be equal to the difference between the original reservation rate and the competing price. The claim must be submitted prior to, or within 24 hours after, making a reservation through a Mansion Lavanda Website, and at least 24 hours before the standard check-in time at Mansion Lavanda. A claim may be rejected by Mansion Lavanda if it is incomplete or concerns a non-Mansion Lavanda website. For the Competing Price to be valid, it must be a currently available lower published online room price for Mansion Lavanda, the same stay dates, the same number of guests, the same room type, with a similar view and room size, and include similar or additional value-added amenities (e.g., free breakfast). Mansion Lavanda will compare the total room cost of a stay, and multiple claims for a stay consisting of two or more nights in the same week at the same Mansion Lavanda. Mansion Lavanda will convert any Competing Price offered in a different currency than the price made available through the Mansion Lavanda Website, and may deny claims where it determines that the difference between the price is due to exchange rate fluctuations. The estimated value of value-added amenities (e.g.,free breakfast, use of Wifi, vouchers) offered as part of a Competing Price will be excluded from the price comparison, and will not be provided by Mansion Lavanda when honoring a lower price. Mansion Lavanda may deny claims where the difference between the Competing Price and the price on the Mansion Lavanda Website is less than one percent. The Best Price Guarantee does not apply to existing reservations that are not booked through a Mansion Lavanda Website, and Mansion Lavanda is not responsible for any fees associated with cancelling a reservation made through a different channel (e.g., a call center, a non-Mansion Lavanda website). If a valid Best Price Guarantee claim is submitted without an existing reservation, the individual making the valid claim will be contacted by Mansion Lavanda and must make a reservation in the manner communicated by Mansion Lavanda within 24 hours from receipt of the communication or local check-in time at Mansion Lavanda Hotel. Failure to make a reservation in the required time period will invalidate the claim. The Best Price Guarantee will be suspended during times where the Mansion Lavanda Websites or certain prices are not available due to an outage, a technical issue or a circumstance beyond Mansion Lavanda\'s reasonable control. Mansion Lavanda has the sole right and discretion to determine the validity of any claim and will not review documentation provided by the individual submitting a claim as part of its validation process. Mansion Lavanda reserves the right to deny a claim, if it cannot independently verify the availability of a Competing Price at the time it processes the claim. Mansion Lavanda may at any time and without notice terminate or restrict a person\'s ability to submit a claim under or otherwise benefit from the Best Price Guarantee, if in its sole discretion Mansion Lavanda determines that such person has: (1) acted in a manner inconsistent with applicable laws or ordinances; (2) acted in a fraudulent or abusive manner, (3) submitted multiple invalid Best Price Guarantee claims; (4) failed to stay at Mansion Lavanda Hotels after receiving approved Best Price Guarantee Claims; or (5) breached any of these BPG Terms. Any disputes arising out of or related to the Best Price Guarantee or these BPG Terms shall be handled individually without any class action, and shall be governed by, construed and enforced in accordance with the laws of Mansion Lavanda. Void where prohibited by law. Mansion Lavanda reserves the right to amend, revise, supplement, suspend or discontinue the Best Price Guarantee or these BPG Terms at anytime in its sole discretion and without prior notice. 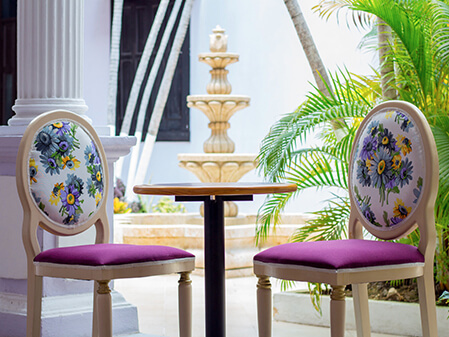 Set in the heart of the vibrant city of Merida, Hotel Boutique Mansion Lavanda provides a beautiful dwelling and stellar service for guests who are looking for more than just a bed to sleep in during their stay in Yucatan. 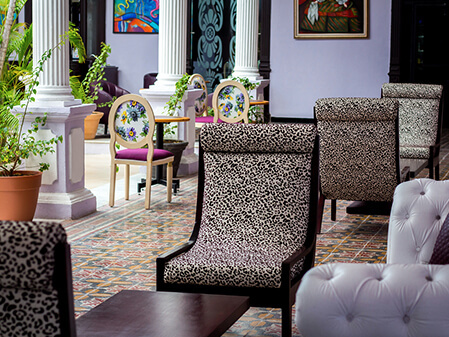 The city’s exotic mix of Mayan, Spanish, British, and French influences are very much evident in the hotel’s gorgeous architecture and interior design. Home in a luxurious setting is what guests can expect during their stay here at Hotel Boutique Mansion Lavanda. We have 28 fully air-conditioned rooms, each furnished with large beds and antique pieces. Old-world styling blends effortlessly with modern conveniences such as Wi-Fi internet access and flat-screen TVs with cable programming, providing an environment of aesthetic and functional splendor. The beauty of our dwellings is matched by the type of service you can expect from a five-star establishment. We have a fine restaurant for your healthy appetites, as well as a bar and lounge for you to unwind and enjoy drinks. We have excellent spa services where you can get relaxing facials and massages. There’s an outdoor pool where you and your family can get some sun and go for a refreshing dip. 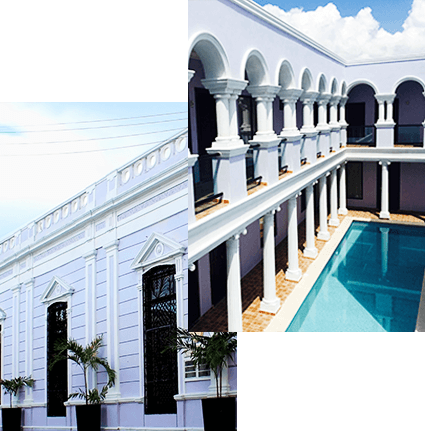 Just as splendid is our property’s location; Hotel Boutique Mansion Lavanda is situated in the heart of Merida. You can easily take a short walk to must-see places such as Plaza Grande, Montejo House, and Macay Museum. 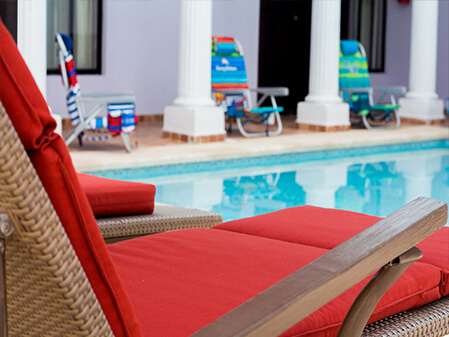 Stay with us to get a feel of an extraordinary Merida vacation. Hotel Boutique Mansion Lavanda is ready to give you the kind of pampering that you truly deserve. Beautiful suites with old-world feel await guests who want to be transported back to the glamour of yesteryears. You deserve nothing less than spacious dwellings adorned with big beds with plush sheets, carefully-selected antique pieces, and modern amenities. Enjoy the conveniences of free Wi-Fi internet, flat-screen TV with cable, room service, and daily housekeeping. Each suite has a private bathroom equipped with bathrobe, slippers, and hand-crafted soap and shampoo. Taste and comfort are very much evident in our spacious and elegant rooms. The ocean or lagoon view that comes with each unit or suite is a refreshing treat for the senses. Whether you’re a leisure traveler or a business guest, you will find the amenities more than suitable for your needs. Each room is equipped with a safety deposit box to keep your valuables safe whenever you’re out enjoying the beach or exploring the city. Convenience is a must of an enjoyable stay and our splendid location guarantees that. Just 10 minutes or less away from the places that matter in Merida, discovering the best of this vibrant city is an easy affair. Visit the Montejo House, Plaza Grande, and the museum by foot. For farther destinations, we can arrange transportation for your use.